I remember the exact moment I caught the 'nids. It was the fall of '98 on the Grand River in downtown Grand Rapids. Or was it '97? Actually I can't really remember that much about it, Experiences that intense have a way of getting fuzzy. Have you been to the Grand River in Grand Rapids MI? Heard about it perhaps? OK, I will cut the romantic crap then. That smell was probably the homeless guy fishing next to me for hours on end. Forget about isolation, you fish shoulder to shoulder or you don't catch fish. As for the fly-line, well you may have a fly-rod but you don't actually use fly-line. The method of choice is called chuck-and-duck. You typically use amnesia running line, large (occasionally a full ounce!) lead weights and some sort of egg pattern with a spawn-sac hooked on. To call it fly-fishing is a stretch. Which brings us to beauty. What the surroundings and methods lack the fishing has in plenty. There are so many varieties of Great-Lakes Salmonid runs in the Grand that there is something long and strong running at least 7 months out of the year. Back to the moment I caught the 'nids. It was my first time at the Grand and by some odd twist of fate we arrived during a rare Lake-Trout run. Whats that...you say Lake Trout don't run? Evidently for some odd reason sometimes they do. Chasing all the free caviar I guess. As a result the first river-run Salmonid I hooked was a Lake-Trout over 10lbs. And the second and the third. Now keep in mind that I had never before caught a fish over 3lbs. It was an insane experience. I believe that we fished for at least 24 hours straight without food sleep and very little water. I had the 'nids bad. For a couple of years I was pretty hooked. My friends and mentors Kurt and Miles dragged me all over the state chasing the runs. 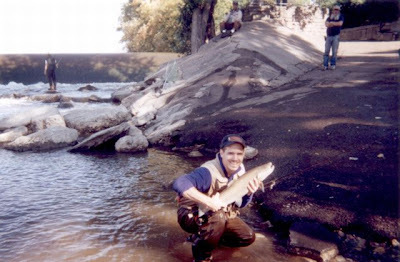 I never was very good at fishing for Steelhead and Salmon and the passion faded eventually. Nevertheless it was a very important experience for me and as I lost interest other species stepped in. Smallmouth Bass, Pike, Carp and anything else that would grab a fly. My case of the 'nids was very important. It taught me that the fly-rod can be used for more than kicking-babies (i.e. trout-fishing). It taught me how to picture what was happening below the water. It expanded my fly fishing horizons. Thanks Kurt and Miles! That awesome trip you took up the Michigan coast a couple of weekends ago did NOT help. I was itchin pretty bad after your report. I was ready to hop on a plane.